I’m starting to consider a replacement battery for my 2015 6.2L High Country 1500. It has the 94R type battery, I believe. I have looked over the threads I could find with the search function without any specific results. One type that came up in a few of the threads is the XS Power brand, but there is not a recommendation for which series is most desirable. I also wasn’t able to find one in 94R. it seems that the majority of newer batteries have lower CCA than I recall in older “heavy duty” batteries. I’ve bought 1000 CCA batteries in the past, but now 800 -850 seems to be about the highest. The new Absorbent Glass Mat (AGM) batteries may be more efficient and therefore can operate reliably with less CCAs, I don’t know. My truck has to be relied upon in rural, cold weather situations, I need a strong, long life battery. That said, my questions are; Exactly which replacement battery have you used? What is good/bad about it and why? What would recommend for an extreme duty battery? What else would you recommend replacing? -I don’t know if these trucks need the “Big 3” replacement -my alternator is functioning within normal limits, but I’m open to replacement options as needed. -my cables seem clean, undamaged and corrosion free. Hello, I have been helped by various posts on this forum for a long time but now joined mainly to ask some questions about upgrading my van. Here is the scenario; my dad purchased the 2000 Chevy Express Conversion Van new from a dealership back in 2001. We used it as a family vehicle for many years but as us 'kids' grew up and married off, the van was left unused. So I purchased it from my dad and have been fixing it up. Whoever did the conversion was an idiot. They took an Express 1500 and made it into a conversion van that weighs 6,800# empty. *The front doors are so heavy we had to reweld the hinges because the factory spot welds were peeling off. *The van had front DRUM brakes which we changed out for a set of Brembo slotted disk brakes. *Changed rear axle ratio from whatever stock was down to 3:73 *I upgraded the wheels from 15" to 17" and the tire size from 26" to 30.5" (yes the front tires rub sometimes, but it is 10X better in snow and rides better.). *I replaced the rear leaf springs with 3/4 ton leaf springs and coil-over heavy duty shocks. *Upgraded the full exhaust system from the manifolds back with 3" pipe and a high flow cat and Thrush muffler. *Replaced the engine after I was a dumbA$$ and never refilled the coolant with coolant after having to add water due to a leak and the block froze and cracked. The replacement engine was taken from a 1999 Chevy Suburban. *The transmission was replaced with a Monster Transmission brand 4L60-E rated up to 600hp and tuned for towing (quick firm shifts) and a heavy duty torque converter. *Replaced all ball-joints and steering bushings. *New "heavy duty" shocks for front suspension - which didn't change anything like I was hoping. Anyway, now I want to upgrade the front suspension because it is SO SOFT that the van struggles to ride flat if the road has any bumps in it. It is 2WD, so no front axle. 1: I want to upgrade the front and rear sway bars, can I just put 3/4-ton or 1-ton sway bars on it? Will they fit? 2: I want to upgrade the front springs and shocks with 3/4 ton springs and shocks. Is this possible? 2b: I would also be happy if anyone new of an air suspension or air-adjustable shocks that might work as well. I can't seem to find anything for front suspension for 2wd Chevy vans or trucks. Thanks for any help. 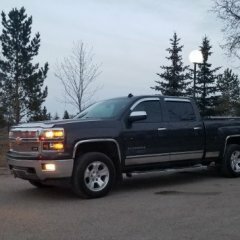 So I just got a 2016 Silverado (specs in sig.) and wanted to upgrade the audio and not bust the bank. So here is my list of parts prices links where I got it, and some pictures of the install. Sundown Audio SA-2.75FR 2.75" speakers for the front dash. $69.99 2 Pair Kicker 40CS674 6.75" 2 way coaxial speakers for front and rear doors. $99.99 Metra 82-3005 Speaker adapter for front doors. $12.00 Scosche SAGMHR634B Spekaer adapter for rear door $10.99 Noico 50 mil Sound deadening material $36.90 uxcell Car Sound Deadener Application Rolling Wheel $6.25 So far I have $236.12 in the upgrade and I am very happy so far. My future upgrade will be a sub. Here are the components I planned to use. Kicker 40CWRT101 CompRT 10" Sub $104.99 Kicker 43CXA3001 600 Watt amp $119.99 Kicker 43CXARC Bass Remote Control $20.98 Soudoffaudio Single Deep Sub Box Passenger Side in Cocoa Color $140 Which brings the Sub install to : $385.96 and a grand total of $622.08 That is a little more than the factor Bose upgrade but it is going to sound way better. IMHO Here is pictures of the factory dash speakers. Here is an up close picture of the back of the factory dash speaker. Here is a side-by-side of the factory and the Sundown replacement speakers Here is pictures of the Sundown speakers installed. Here is a picture of the front door completely stripped. Side-by-side of the factor front door speakers and the Kicker replacements. Picture of the sound deadening material installed and then one of the speaker installed. Here is a picture of the factory Rear door speaker installed. Here is picture of the rear door stripped with some of the sound deadening installed. Side-by-side of the factory rear door speaker and the kicker replacement. Here is a picture of the rear speakers installed. For Members with Factory Rancho shocks on your K2, Do you still have them and Like/Love them or Have you ditched and upgraded to New Shocks? What are some good engine and drivetrain upgrades? Hey all, I have a 2017 LT 5.3 Z71 that just turned over 10k miles. I've never had a truck under warranty so I haven't jumped into many mods yet (did an intake tube and hoping for an exhaust soon though). Trucks/jeeps I've had in the past I've upgraded the transmission pan to hold more fluid/cool better, on my Tahoe I did the same to the rear differential cover for toughness and cooling ability. I've never had a new truck but plan on holding onto it for a long time so my thoughts are longevity/preventative/bulletproofing the drivetrain. Anyone have thoughts/experience/opinions? Thanks! Can the LED lights from a 2016 LTZ plug & play into a 2016 LT? Hey guys. So I just bought an 03 1500 LS and I hate the look of the steering wheel. My buddy has an extra wheel from his 08 1500 (which I much prefer). Is there anyway of swapping the second gen wheel into my first gen? Thanks for your time. Hi, I'm relatively new here so forgive me if this has been covered. Does anyone here know the items required and the part numbers to upgrade the OnStar Nav radio (IO5) to the full Nav (IO6) system? I've seen where it's only a cable and in other places you need to get a number of parts. If anyone has any experience with this mod I would really appreciate as much info as possible so I can go ahead with this mod. Thanks ahead of time for any help and info. Greetings, all. ​I'm still learning here and am wondering about something I ran across recently. (Sincere thanks to everyone on here who has already been a huge help to me thus far!) I understand that the increased-power/heavy duty alternator (part number 22949467) appears to have made its way into many 2015 CrewCab models and other models with the snow plow-prep package. It seems tied to RPO 5W4 (which, in several sources I've researched, ties back to "VEHICLE SPECIAL SERVICE, MUNICIPAL" - makes sense for a snow plow-prep package). ​I scored a fantastic deal on one of these units for my 2014 Silverado LTZ Z71 DoubleCab 4X4. Being an LTZ, my Silverado has most of the current-drawing goodies. It also is about to have the factory Kicker subwoofer upgrade kit, an on-board air compressor (Viair 40049) and a full front/rear dashcam set-up with active/passive monitoring. I've also just paired all of this with a brand new AC Delco AGM deep-cycle higher output battery (P/N 94RAGM). In other words, all of the further current-drawing goodies are here and ready to be installed when the weather here gets a bit warmer. Are my electrical upgrades going to be good enough to support an already high current use truck with an extra draw or three?